Qmobile added new smartphone in its Z series Qmobile Z6 which is low in prices but have more features as compared to other Z-series smartphones except camera because Z5 has 16 Mega-Pixel rear camera and Z6 has 13 Mega-Pixel rear Camera. 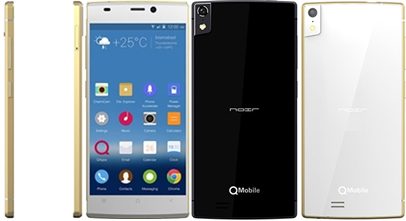 Qmobile Z6 smartphone available in two colors Black & grayish-white. Android 4.2-Jelly Bean, 1.7 GHz Octa Core, 16 GB Built-in Storage with 2 GB RAM, Single SIM support Micro, 5-inches Super AMOLED, FHD with 145.1 x 70.2 x 5.55 mm size, 3G (WCDMA 900/2100), WiFi 802.11b/g/n, GPRS, EDGE, WAP, MMS, GPS, AGPS, Bluetooth. 13 Mega-Pixel AF rear camera with LED Flash and 5 Mega-Pixel front Camera for video calling and self snaps. Audio Player, Video Player, FM Radio, Battery power 2300 mAh, Torch.